Sitting is believing! 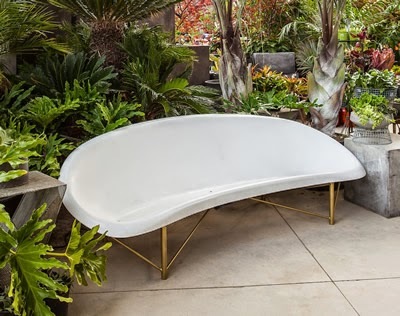 Having sat in one of these myself, I was totally sold by Aaron Jones' Helios outdoor lounge. While it may not look that comfortable, well, looks can be deceiving. If you live in SF, go to Bar Agricole and try it out yourself. Or if you made it to SF Decorator Showcase house this year, they had one too. The chair just envelopes you somehow and made you think why didn't someone come up with this like twenty years ago??! Now about that propane heaters in your backyard... it's time to let them go.